This week, we've decided to create almond-infused vodka. 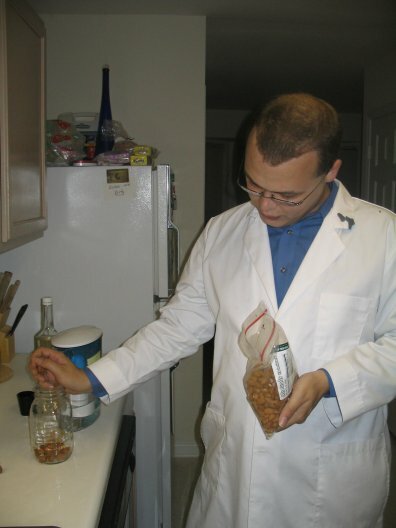 We picked up a bag of whole almonds, and Wayland dropped a few generous handfuls into the Science Jar. We're expecting this to be a long infusion, and difficult to get a great deal of flavor from the almonds. To help this along, we put quite a few almonds in here, filling about a quarter of the jar. The vodka immediately turned a pale shade of tan, no doubt due to the almond "dust" that inevitably went in. We'll probably have to go back to straining this with a coffee filter when it's done. We'll check back on this in a week. 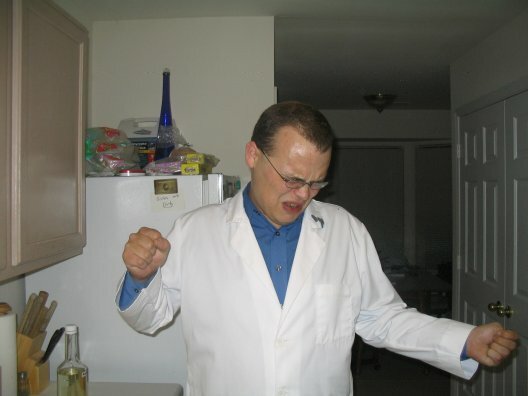 The Mad Scienticians subjected the rosemary vodka to two tests, one a preliminary tasting to check its status, and the second an official sampling after bottling. The first test was conducted last Friday, two days into the infusion. 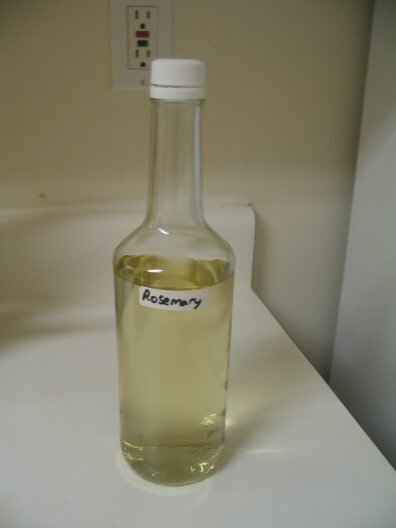 At the time of this initial test, the vodka had not quite achieved much rosemary flavor. I found the vodka to be the primary taste, but even that wasn't very strong; the flavor of rosemary was subtle, but with much potential. Wayland described it as "odd but mild," also noting that the vodka taste was not overwhelming. I decided it shouldn't need more than another day. We did not have time for another round of tests the next day, but we did take a moment to bottle it, to prevent over-infusion. We finally were able to give it a final test last night. As you can see above, the vodka attained a pale green appearance from the infusion. I found this vodka to be smooth, with no vodka burn at all. The rosemary flavor was much more pronounced than in the first test, but it was still subtle. I like it, though it needs another flavor to compliment it. 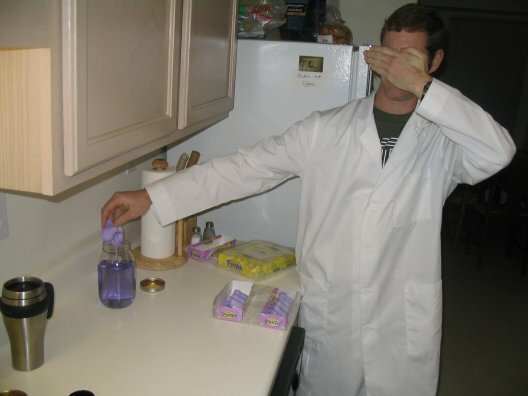 Though I have reacted to several of our experiments in this way (including the spearmint vodka, which Wayland rather liked), this is quite rare for Wayland. In fact, I cannot remember an infusion which I liked and Wayland disliked, especially to this degree. His only verbal reaction to this one: "I do not like it, Sam I Am." Ah, well. I doubt if I will convince Wayland to try this in a cocktail, but I'll try to whip something up for myself and rate it. I'll also try using it as a marinade. This vodka infusion is the first of our experiments to have its own soundtrack. 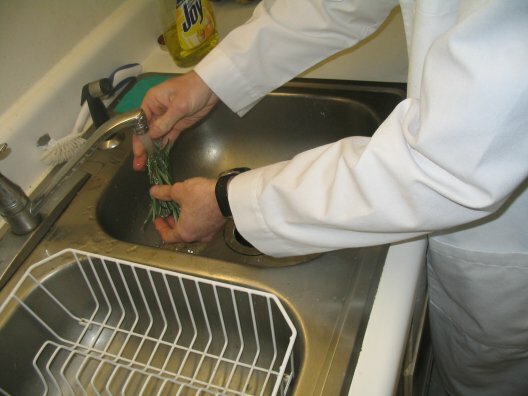 Any time the Mad Scienticians make anything that involves rosemary, we get automatically earwormed. I get the song "Evil" by Interpol stuck in my head, whereas Wayland usually gets Simon and Garfunkel's "Scarborough Fair." We began thinking about a rosemary-infused vodka after using our garlic and jalapeño vodkae to cook a beef roast. We marinaded the roast overnight in the two vodkae, then combined the leftover marinade with other ingredients to pan-cook the roast. (We used a variation of this recipe, substituting the vodka for the wine.) Needless to say, the roast tasted delicious. We considered what other vodka infusions would work well as a marinade, and naturally, rosemary (one of our most commonly used seasonings) was the first we thought of. Don't worry, this isn't going to turn into a cooking blog! I'm sure we'll come up with a drink to use this in, too (other than the obvious choice, yet another bloody mary variation). 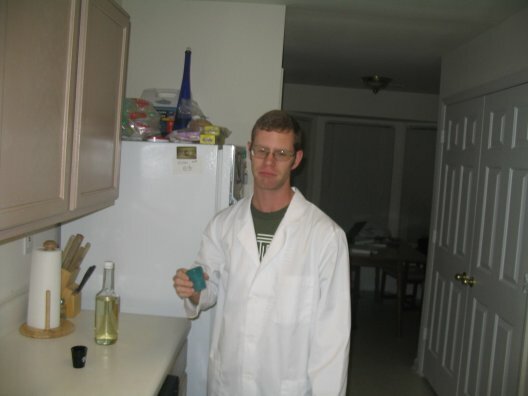 But there's more to alcohol than beverages, and as scienticians, we want to put our experiments to every possible test. 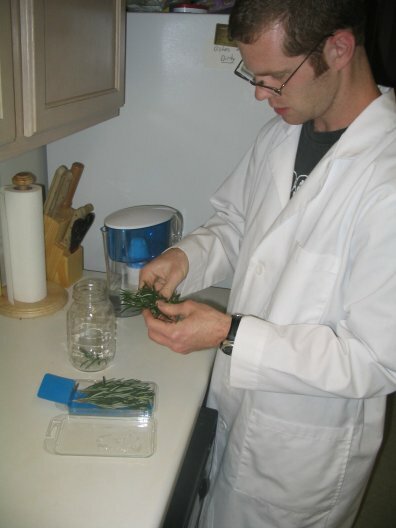 We began this infusion by acquiring some fresh rosemary. We found a package of three sticks, each thickly covered in the narrow leaves. We used only one of these sticks. I washed the rosemary and stripped the leaves off of the stick. Once all of the leaves were removed, I discarded the stick itself and poured in the vodka. We doubt if this will take more than three days; perhaps four at the outside. We made the mistake of infusing our spearmint vodka for five days, and I find it unbearably strong. 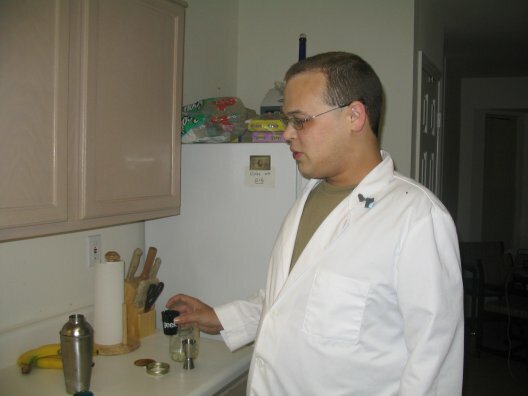 To prevent this, we intent to take a small sample of the rosemary vodka after two days, and then daily until it is done. At that point, we'll post the results. Ack! Last Tuesday, we promised we would subject the grape vodka experiment to its final test that night. Well, we dropped the ball, and didn't get around to it until this weekend. Today we have preliminary results for our cantaloupe vodka, as well as the grape vodka's final disposition. 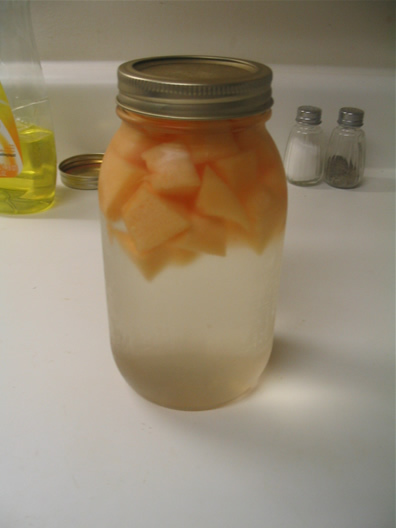 The cantaloupe vodka hasn't visibly changed much. The fruit appears to have puffed up slightly, but not nearly to the extent found in our pineapple vodka experiment. The vodka itself is slightly cloudy but uncolored. The verdict: as we suspected, this infusion is going take longer than a week. It's further along than either of us expected, and has the potential to be quite tasty, but it needs more time. The grape, on the other hand, has exhausted our patience. After the previous test, we decided that the next sampling would be the last, determining whether the grape vodka was destined for the bottle or for the drain. When it came time for this test, the appearance of the browning grapes themselves did not inspire a great deal of hope. True to our word, however, we poured two shots and tasted them. "Neutral all the way back," Wayland commented. As before, the vodka has only a hint of grape taste. It's not bad, but there's really nothing to this vodka. We decided to keep it, but only as a backup to our unflavored baseline vodka (which we rarely use anymore). As such, we won't be posting any grape vodka cocktails. However, we may reevaluate our methodology and try a different grape experiment in the future. 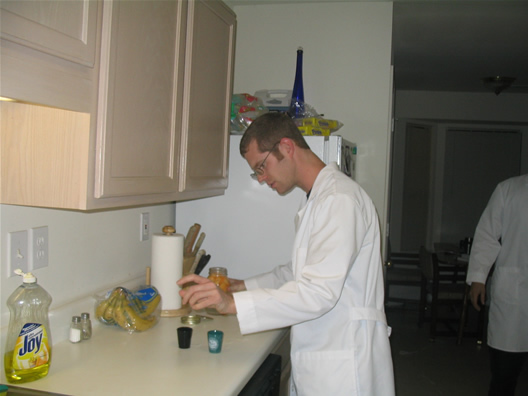 The Mad Scienticians are experimenting with cantaloupe-infused vodka this week. Though I am unsure of what this vodka will go well with, I am excited about this experiment; cantaloupe is my favorite fruit of all time. To create this infusion, we cut half a cantaloupe into wedges, each wedge comprising one-eighth of the fruit. Then we gutted the seeds from each wedge, sliced the wedges into chunks, and cut the rind off each chunk. We only used three of these wedges; I ate the fourth, and am saving the other half for Saturday's breakfast. Yum. We suspect that this will require a long infusion, but we will test it in a week and see how far it gets. Tonight, we will be subjecting our grape vodka to its final test, for better or for worse. Stay tuned for the results! We made this drink soon after infusing our second batch of cinnamon vodka. This batch came out a little spicier than the first, possibly because we didn't add any sugar to the second. As a result, the cinnamon taste is fairly strong in this drink, but not prohibitively so. The taste of the drink changes with each sip. It started out overwhelmingly cinnamon, but that subsided after a couple of sips. Chocolate pops up in varying intensities and intervals, then Irish Cream. Eventually I realized what it needed to tie everything together, and sprinkled a little nutmeg over the top. That sealed the deal. It tastes like all that's good about egg nog, without the slimyness. "The Irish Cream is almost an afterthought," Wayland said. "A whisper of chocolate shifts around, sometimes on the back end, sometimes the front." Unfortunately, we cannot use our chocolate vodka for this, or any other drink that needs to be shaken. The chocolate particles seem to stick to the ice when we do this, extracting the flavor. Thus, any martini-style drinks involving chocolate flavor will likely contain crème de cacao, though at some point we will experiment with stirring, rather than shaking (regardless of our fanboy resistance to the idea). The jalapeño in this drink provides a slight burn, which is mostly neutralized by the cream. Delicious. The day after beginning our morally ambiguous Marshmallow Peeps vodka, we discovered that the remaining lumps of goo can be easily dissolved by shaking the jar vigorously a few times. Once dissolved, we tasted the vodka; this first tasting was not done in full accordance with scientific controls, so we have no pictures. 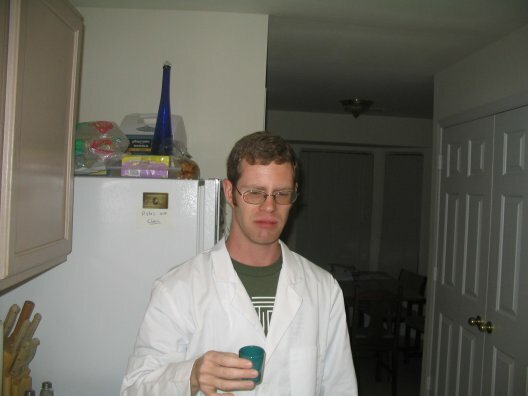 We decided that at this time, the vodka had very little taste, only a vague sweetness on the back end. We decided to add two more Peeps -- for a total of four -- and give it another day. 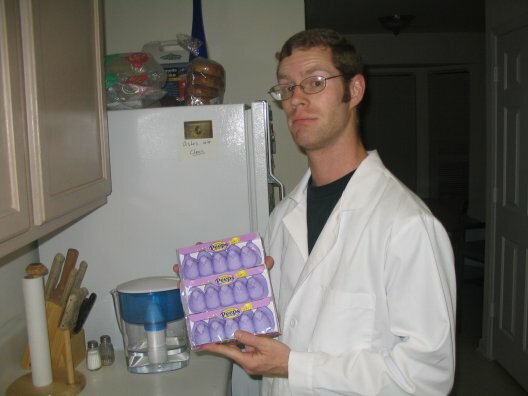 Now, though the Mad Scienticians have not personally experienced Peeps in conjunction with liquor before this experiment, our friends have told us the tale of one previous occurrence. One of our friends concocted a drink whose configuration I am unaware of, but it contained vodka, and was topped with whipped cream and a single Peep. But these were not just any Peeps; they were the Valentine's Day strawberry hearts. These Peeps are so sickeningly sweet, I cannot eat them, and I like regular Peeps. Needless to say, the drink was a horrible failure, and was rejected by at least one stomach. 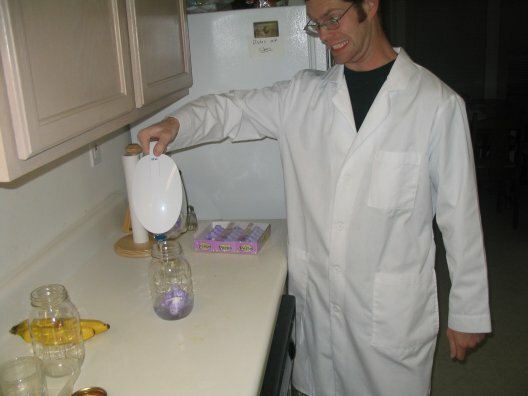 With that knowledge, we had no expectation for our Peeps vodka to turn out particularly well. 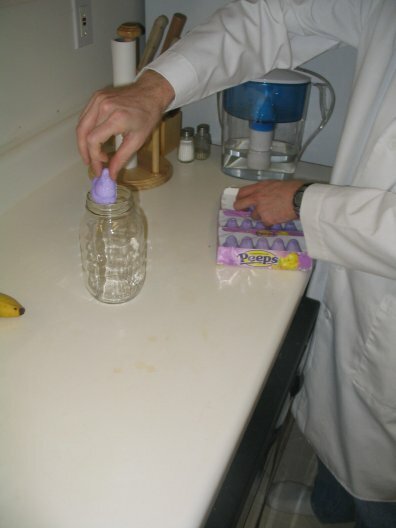 Like Oppenheimer before us, we developed Peeps vodka because it had to be done, regardless of our personal feelings about the work. But even we didn't expect what happened next. 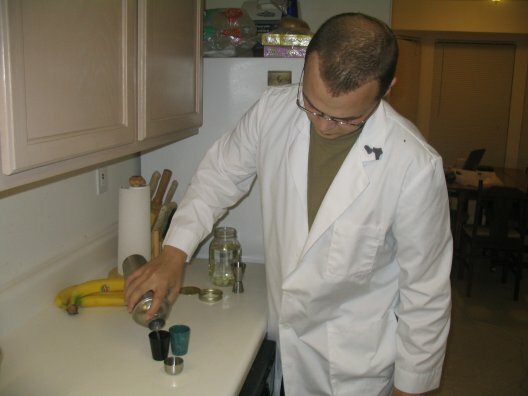 As longtime readers will know, we don't use straight-off-the-shelf vodka for our experiments. 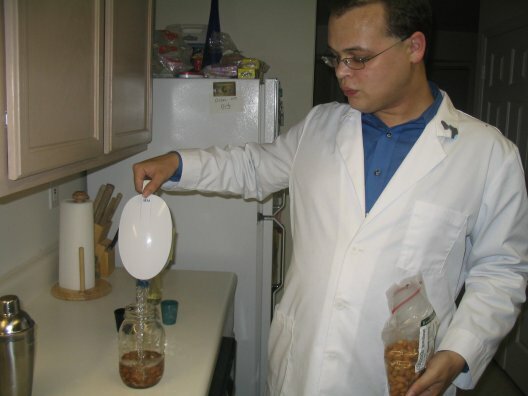 As we described in our initial post, we purchase cheap, bottom-shelf Vladimir vodka, and filter it through a Pur water filter five times. 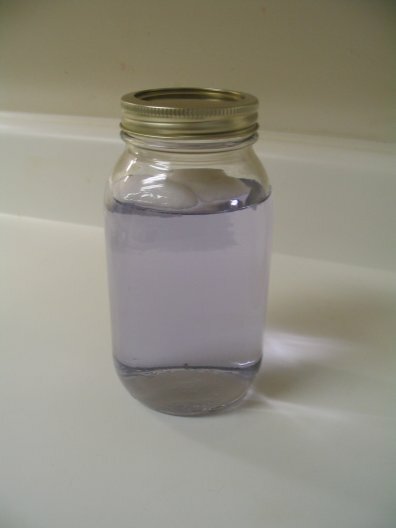 This removes most of the impurities and transforms the vodka into a smooth, middle-shelf grade. Somehow, however, the Peeps have reversed this process. The Peeps apparently contain enough artificial components that they re-introduced the impurities that we had taken such pains to remove. This, combined with the sickly sugary sweetness of four liquefied Peeps, made for what may be the worst alcoholic beverage we have ever tasted. 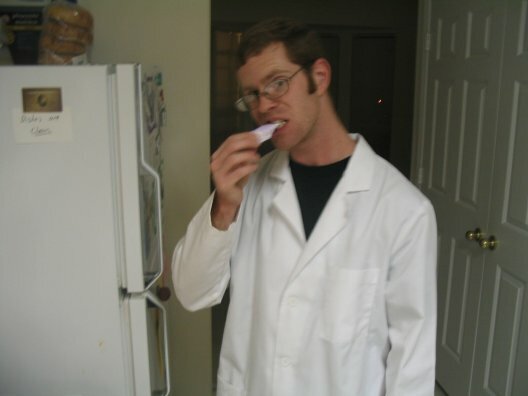 We decided there was only one thing we could do with this experiment. It will become a display piece for future parties, possibly atop our fridge next to the Water of Life. This is the mysterious blue bottle which you may have seen in the background of many of our photos, including the above. 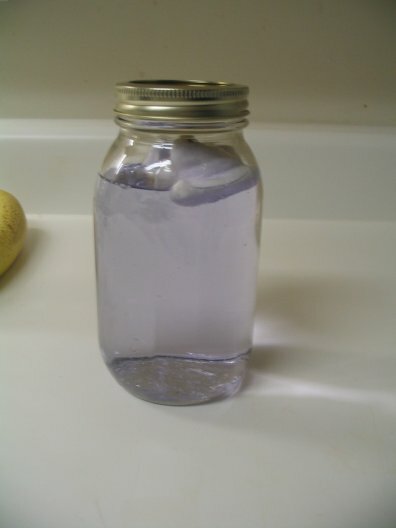 The Water of Life is a concoction created by an old friend of ours several years ago. 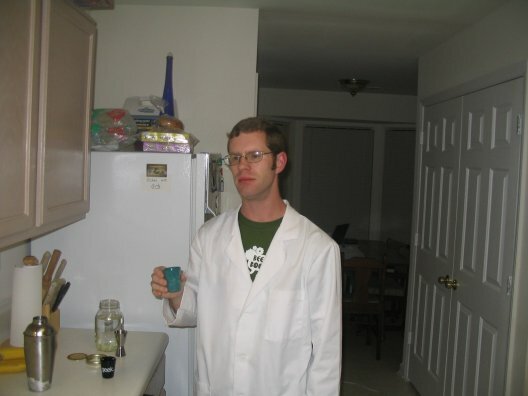 The first batch was a delightful, refreshing mix of liquors and liqueurs; the second batch, however, included a disproportionate amount of peppermint schnapps, which made the drink taste like toothpaste. 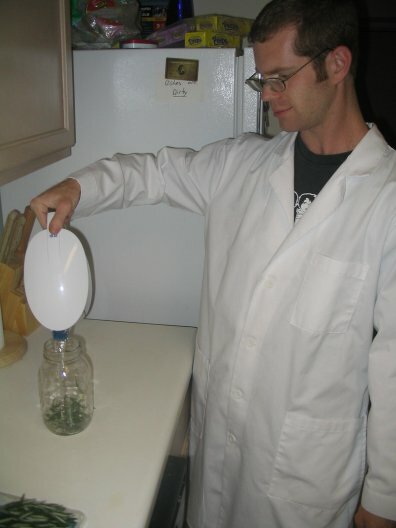 This batch was eventually dubbed a "bottle of stupid," and was handed over to us to get rid of it. If the Peeps vodka is destined to have a place next to the Water of Life, we shall have to find an extremely nifty bottle that the vodka doesn't come close to deserving. Until then, it will be hidden away in shame. We will probably pull it out for parties for display purposes only, though we haven't ruled out daring first-time visitors to try it. 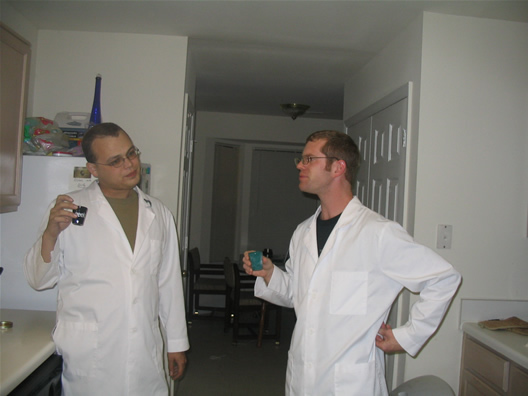 But first, just to ensure that this remains the most monstrous, toxic beverage in this or any other laboratory, we added another two Peeps, bringing the total to six. We did this mainly to deeply disturb visitors by increasing the number of Peep eyeballs. We also sampled the grape vodka the same night, though in retrospect, we should have tested it before the Peeps vodka. Alas, it was my turn to go first. I cannot blame this reaction entirely on the grape vodka. I am convinced that the preceding test of the Peeps vodka tainted my palate (and digestive tract) for the night. That said, the grape vodka is not very good at this point. Neither of us detected any grape taste. It seems to have somehow regressed since last week's test. We decided to put it back in the fridge for another week of infusion, but if there's no improvement by then, we may have to scrap this experiment and try a different methodology. Round Two of "Name That Vodka!" 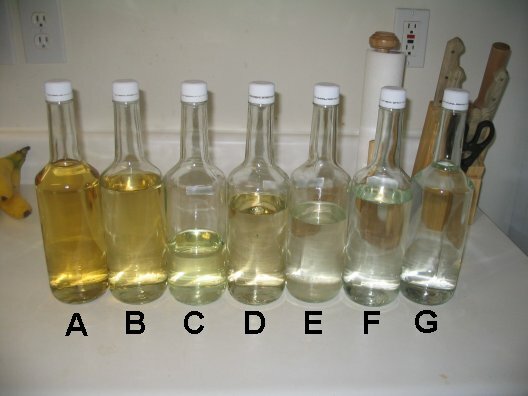 After our first several successful experiments, we challenged our readers to identify our vodka infusions by color. Today, we have a more difficult challenge for you, as we have created a number of infusions lately that lack much in the way of color, only exhibiting varying degrees of cloudiness and yellowness. The photo below contains the following vodkae, but not in this order: Apple, Coconut, Garlic, Jalapeño, Pineapple, Spearmint, and Vanilla. Who can determine which is which? We will announce the answers, and winners (if any), on Friday, as well as several new cocktails. Tomorrow, tune in for an update on our Grape and Peep vodkas. The Mad Scienticians have a very special experiment for you this week, for we are celebrating not one, but two auspicious occasions. The first, of course, is Easter; the second, our 50th post here at Infusions of Grandeur. And what better way to celebrate Easter than creating Marshmallow Peeps vodka? True, it's not an idea that most people's logical thought processes would produce, but that's why we're Mad Scienticians, folks. We picked up a pack of purple Peeps (say that three times fast) and began this horrendous deed. We decided that one Peep was not sufficient. No, it was not enough for a single Peep to die alone; we wanted the Peep to see the fear in the carnauba wax eyes of one of its comrades before it was all over. 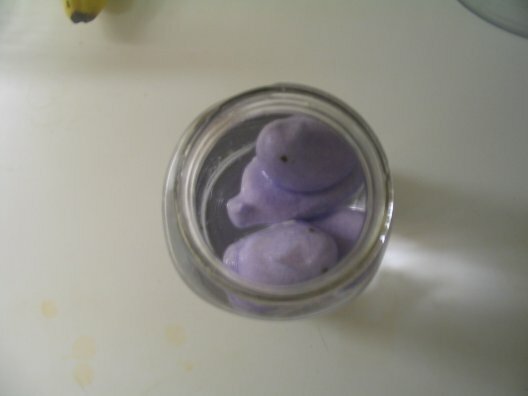 The Peeps float atop the vodka, still pleading for mercy even as their purple sugary coating begins to dissolve. Just to shatter any delusions of mercy they may still entertain, I ate one of their brethren right in front of them. With that, we closed the jar, sealing the Peeps to their doom. 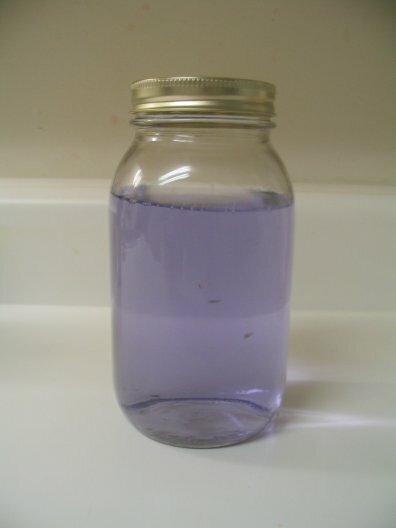 You can see the vodka already turning purple as they slowly dissolve. 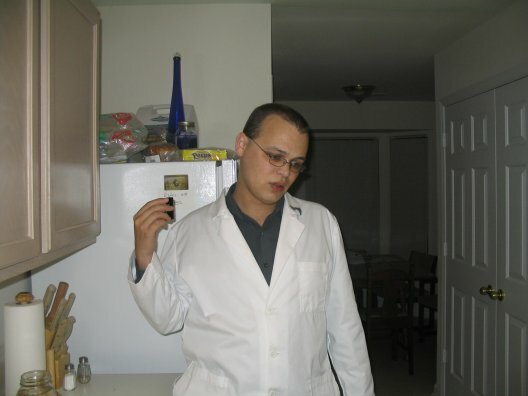 By the next day, as I entered the laboratory and recalled my abhorrent acts of the night before, only lifeless, shapeless white lumps of marshmallowy goodness remained of the poor Peeps. By this point it was too late; I had been consumed by the dark side. 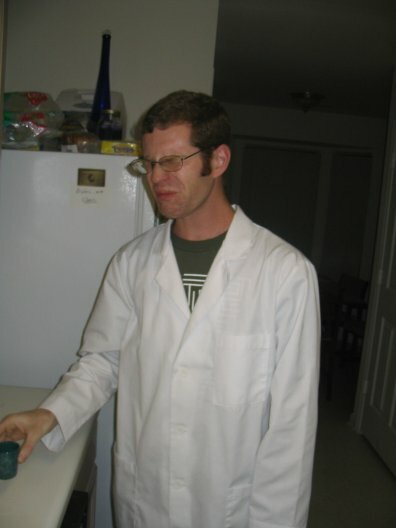 This was bad science, folks, and went against the very principles that Infusions of Grandeur was founded upon. For the remainder of my days, the terrible deaths of these innocent Peeps will lie on my conscience, and I must learn to live with that shame. 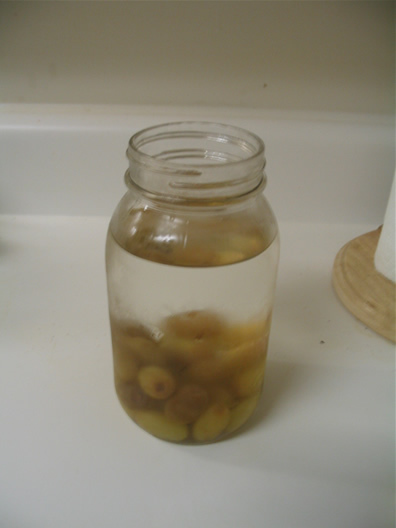 This weekend, we tested the garlic vodka experiment after five days of infusion. 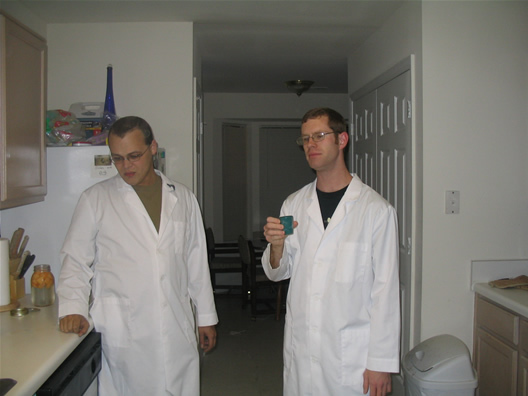 We were a little worried about how this would turn out; though the Mad Scienticians are both fans of garlic, we had concerns that the bite of the garlic would team up with the vodka's kick, and use their synergetic powers for evil. As it turns out, we had nothing to worry about. Since this infusion was carried out at room temperature, we decided to shake the sample with ice before tasting. Wayland, who was dreading the worst-case scenario at this point, steels himself for the inevitable. "It's very smooth, with almost no vodka burn," Wayland says after downing the shot. "It's actually a little sweet, too. I wish I knew what the frell to put it in." The vodka definitely tastes like garlic, especially at the front end. The back tastes more like vodka, but it doesn't kick you like vodka normally does. It's quite good, much better than I expected. We used the garlic vodka to create a couple of drinks. Look out, folks, the first one is a shooter! 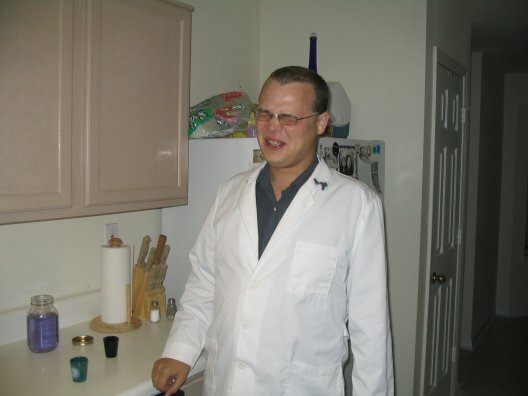 Shake the two vodkas with ice, and pour into a shot glass. Then add a few drops of Tabasco over the top and drink. Wayland doesn't care much for the name I gave this drink. I think it's an awesome name. It's the Dr. McNinja of drinks. He did comment on the health-conscious nature of the drink, though, combining spicy with garlic: "It clears your sinuses and lowers cholesterol!" But what does it taste like, you ask? The spiciness doesn't hit you at first; it tastes like garlic and bell pepper, then a slow burn sets in. Very tasty. "And now my lips tingle," said Wayland. "You don't taste any alcohol in that. That's a scary shot." We envisioned these becoming a party contest, to see who could down the most Vampire Chupacabras in a row. Whoever would win, I'm pretty sure our asses would lose. Again, like the jalapeño Caesar, Wayland bowed out of this one due to his unwavering distaste for all things tomato. Personally, I think this drink is delicious; the garlic is the perfect complement to the tomato juice.